The M23 rebels in the eastern Democratic Republic of the Congo took control of the provincial capital, trade port and NGO hub of Goma this morning. According to the Associated Press, "Explosions and machine-gun fire rocked the lakeside city as the M23 rebels pushed forward on two fronts: toward the city center and along the road that leads to Bukavu, another provincial capital which lies to the south. Civilians ran down sidewalks looking for cover and children shouted in alarm. A man clutched a thermos as he ran." Reports indicate that the United Nations Organization Stabilization Mission in the Democratic Republic of the Congo (MONUSCO) have provided little support during the advances by the M23 rebels. "MONUSCO is keeping its defensive positions. They do not have the mandate to fight the M23. Unfortunately, the M23 did not obey the MONUSCO warnings and went past their positions (at the airport). We ask that the MONUSCO do more," said UN Congolese military spokesman Olivier Hamuli to the AP. M23 made it into the city today and took the city airport after noon. Andrew Gatehouse, a correspondent from the BBC, reported this morning that no fire was exchanged as the rebels entered the city and they took what he described as a 'victory lap' around the city of Goma before a good portion exited the city. However, some rebels to remain in Goma and appear to be taking position in a director towards the city of Bakavu having taken control of a part of the road that connects the two cities. Rwanda makes a few appearances in reports due to regional allegations and recent findings by a UN panel that the government is providing support for M23. "On Tuesday, a colonel in the Congolese army who was in Goma fighting the rebels said by telephone that the soldiers he is fighting are Rwandan. He requested anonymity because he is not authorized to speak to the press," reports the AP. The continued progress of the rebels makes it hard to ignore the evidence that they are receiving support from Rwanda. Jason Stearns provides some analysis this morning as to what the latest developments mean in regards to Rwanda's connection to the rebellion. If the rebels take Goma, thereby humiliating the UN and the Congolese army, they will present the international community with afait accompli. Yes, it will shine a sharp light on Rwandan involvement, but Kigali has been undeterred by donor pressure thus far, and has been emboldened by its seat on the Security Council. Also, as the looting by the Congolese army and their distribution of weapons to youths in Goma has shown, the battle for Goma is as much of a PR disaster for Kinshasa as for Kigali. In any case, at least in the short term, if Goma falls, donors––and probably the Congolese government––will have no choice but to deal with the rebels and call on Rwanda to help. Already, UN Secretary-General Ban Ki-Moon has called on President Kagame to “use his influence on the M23 to help calm the situation and restrain M23 from continuing their attack." M23 demanded peace talks with the Congolese government on Monday that were summarily rejected. 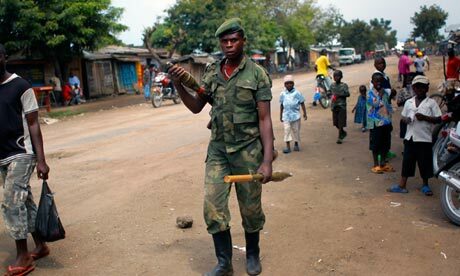 The rebels threatened to continue into Goma if their talk demands were not met. The situation is one to follow very closely now that the rebels followed through on their threats and the complication created by the alleged involvement of DRC's neighbors. I’ve been getting most of my updates on M23′s attacks near Goma from Twitter (in what’s been quite a week for social media and conflict). English-language reporters on the ground in Goma include Melanie Gouby, Phil Moore, Gabriel Gatehouse and Simone Schlindwein. Jonny Hogg is reporting from Kinshasa, and Desiree Lwambo appears to be near Goma but is keeping mum for the moment. Other knowledgeable people providing analysis from outside the DRC include Laura Seay, Jason Stearns, Koen Vlassenroot, Mvemba Dizolele,Tristan McConnell, Christiane Kayser, Christopher Ethuin, and the pseudonymous Digital Djeli. The best non-Twitter resource I’ve seen is Radio Okapi, the UN-sponsored Congolese station (in French). The UN news site includes limited information on MONUSCO’s response to the conflict, and Kabila’s site has a similarly limited set of articles on the Congolese government’s response. M23′s perspective is provided at their website.